The Cuisinart C59CE-7BDB is a 7-inch bread knife that is sharper than traditional stainless steel blades. This knife is designed to cut into a crusty loaf or a soft roll with ease. It is ergonomically designed to provide comfort and easy movement. 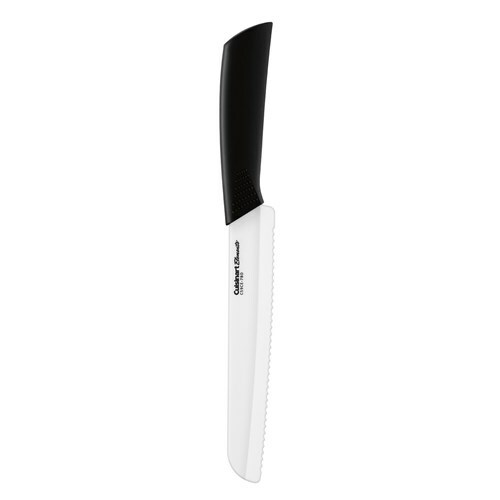 The durable ceramic blade is finely serrated to cut through softest bread without crushing it. This knife has a blade that is of superior quality than stainless steel and is break-resistant. The Cuisinart C59CE-7BDB has many exciting features for users of all types. The Cuisinart C59CE-7BDB is sold as a Brand New Unopened Item.